Tectonic activity, as earthquakes and volcanoes, had great influence in antiquity (as in the modern period) on the course of development of civilizations and other complex cultures. Beside the obvious destruction, tectonism apparently accelerated cultural development. In a previous posting (1), a connection between active tectonic loci and the propagation of ancient civilizations was suggested, based on the much closer spatial relationship of derivative civilizations than of primary ones to tectonic boundaries. A derivative civilization could obtain its initial contact with more senior neighboring civilizations via trade, colonization, or warfare (tourism was probably a minor factor until later). Of these, trade seems the most likely impetus for a younger culture to combine inspiration from outside with its own character to form a new civilization—but the other possible factors will be addressed also. Since the derivative civilizations propagated by trade in such a way that they all ended up looking like beads on a string defined by tectonic boundaries (2), propagating trade routes must have a tendency to follow tectonic boundaries—only that way can derivative civilizations appear to have threaded themselves onto the tectonic string. Since both trade routes and tectonic boundaries are geographic phenomena, we can examine this possibility with spatial comparison. The commodities being traded may or may not be important, though a few examples involve commodities related to volcanism (3). 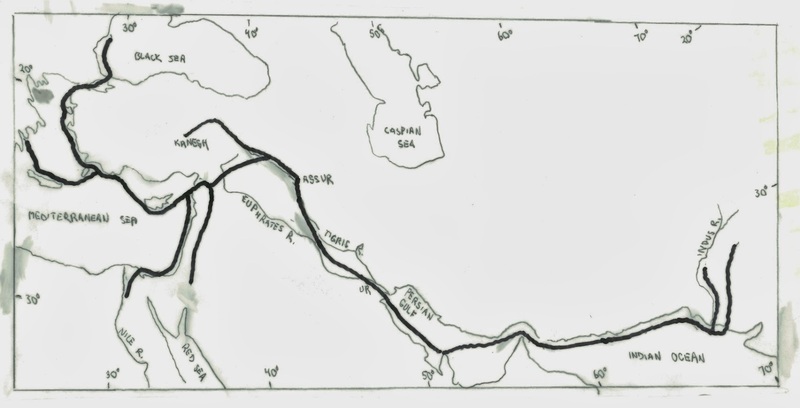 More useful is archaeological and historical information on intermediate stops and former end-points of the trade routes, and the following discussion is based on the evolution of routes as shown by these sites. Since trade inherently varies through time, it seems useful to choose some individual time intervals in antiquity for analysis. At later periods in antiquity, everybody was trading with everybody else, making analysis of routes difficult and complex. The times chosen are therefore those in which new trade patterns began to emerge. Working backward in time, they are the periods 900-700 BC (Iron Age), 2200-1900 BC (Bronze Age), and the Neolithic. Emerging from a dark age.—The period 900-700 BC is one in which much of southern Eurasia was still emerging from the collapse of previous civilizations. This period separates Mycenaean from classical Greece, for example. Maritime trade of the period was dominated by the Phoenicians. Land-based trade was already complex by this time. Later classical Greek civilization resulted from a synthesis of imported cultural inspiration and local reminders of a heroic and unified cultural past. The rapid evolution of certain cultural characters, especially ceramic arts, has been used along with their distributions to portray the paths taken by growing trade connections. The late Nicolas Coldstream (4) divided emerging maritime trade connections of this period, called Geometric after its pottery decoration scheme in Greece, into four stages. My plot (fig. 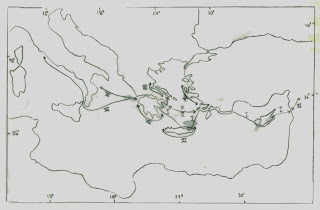 1) of the connections he describes shows the tendrils progressing through these stages from Phoenicia to Cyprus, Rhodes, northeastern Crete, a bit of the Ionian coast, and southeastern Greece, then to include eastern Sicily, Magna Graecia (southern Italy), and the rest of Greece, Crete, and the Ionian coast. Viewed from the Greek side, before about 900 BC, virtually no trade extended outside the rural areas surrounding each town in mainland Greece (fig. 1). The first glimpse of more extensive trade comes in Early Geometric I time (about 900-875 BC). The first tendrils extend from Attica (the Athens region), Lefkandi on Euboea (Evia), and Corinth to nearby coastal regions (Argolid, Boeotia), but also abroad to the northern shore of Crete near Knossos, and intermittently across the Aegean Sea to the southern Ionian island town of Cos. By the Middle Geometric period (about 850-760 BC), trade routes extended such that Attica was in more direct contact with Phoenicia via all of Crete, the Cycladic and Dodecanese islands, and the southern Ionian coast. Greek contacts began to extend westward to the heel and around the toe of Italy to Etruscan towns north of Rome (which was still a village at this time), to begin the Orientalizing period of the Etruscans (5). By the end of the Late Geometric period, about 700 BC, trade contacts from Greece extended to eastern Sicily and all the southern and western Italian coasts, whereas those from Phoenicia extended via Carthage and western Sicily to Etruria. The actual maritime routes taken would be lost to us but for evidence from stone anchors, distinctive large donut-shaped anchors found in remarkable abundance on sea floors under marine trade routes of certain periods (6). These show that the route Phoenicia-Cyprus-Rhodes-Crete-Greece (fig. 1) was the most common in the late Bronze Age, and other evidence suggests it was still most common in the early Archaic (6), thus bracketing the Geometric period. When the Phoenicians first ventured to the far west, they left the northern Mediterranean near Sicily and/or Malta, crossing to Carthage, then traded along the Algerian coast to Gibraltar (7). Note how closely these routes mimic the southern boundary of the Eurasian plate (fig. 2), departing only in crossing the Adriatic directly. 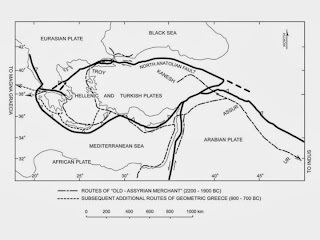 The routes even replicate the twin arcs of the subduction zones along the southern margins of the Turkish and Hellenic microplates, shaped like a chain draped from three posts (fig. 1, 2). An itinerary of a journey recorded at the base of Amonhotep III’s mortuary temple is of a round trip that begins and ends at Amnissos on the north shore of Crete, a port of Knossos. Every one of the eleven stops is along a tectonic boundary as shown in fig. 2, in a sense recreating that diagram, including Ilios, the Levant, and Egypt (8). Other efficient routes could have been taken—along the Libyan coast, then across via Malta to the French and Spanish coasts—thus avoiding tectonic boundaries almost completely (9). But these routes were generally not taken; there must have been favored coasts and favored islands, and these prove to be on the tectonic boundaries. The “old-Assyrian merchant”.--If we could look in on an earlier period, 2200-1900 BC, we would see trade networks emanating from Mesopotamian centers, especially Ur during part of this period. Several satellitic trade hubs were in operation. Assur, the original center of Assyria, was established as one such hub--hence the title of this subsection (10). Assur brought tin from the northeast, copper from various sources including Oman via the Persian Gulf and Ur, and from Cyprus via the Levant, exported to Kanesh, an entrepot and metallurgical center in central Anatolia (fig. 2). By this time, trade had long extended across an arc defined at various times by Palmyra, Ebla, Aleppo, and Charchemish through Damascus to the Jordan Valley and the Mediterranean coast, and eventually to Egypt. A satellite hub was Troy, from which trade extended to Macedonia, Aegean islands, the Peloponnese peninsula, Crete, and the Danube (fig. 3). This was Troy II, a Troy that long preceded the “Trojan War”. In the other direction, trade had been established with the Indus Valley civilization, as documented archaeologically and from Mesopotamian records. This trade was via the Persian Gulf, Sutkagen Dor on the Makran coast, and Indus Valley ports at the Rann of Kutch on the Indian Ocean (11). In aggregate, this trade network extends over 5000 km, including some considerable maritime links, and almost all of it closely mimics the southern margin of the Eurasian plate and associated microplates. The intermediate entrepots at Troy, Damascus, Assur, Ur, and on the Rann of Kutch are about as closely associated with these tectonic boundaries (figs. 2.3) as are the originating sites of the ancient civilizations, i.e. far too close to be considered distributed at random. Again, other routes could have been taken, shorter ones. Land routes could have crossed from Mesopotamia to Egypt via southern Syria and Jordan (and later on some did) but instead followed the “fertile crescent”. Trade might have crossed through Iran and southern Pakistan (and some did) but most of it instead followed the Makran coast to the Indus. From Kanesh in central Turkey trade might have extended directly to Troy, but Kanesh apparently was the end of that road, and others along the southern and northern margin of the Turkish and Hellenic microplates led to Troy instead. Neolithic hints.—How far back can we trace this pattern, and what were the first trade routes in the region like? For that we go beyond our civilizations themselves, into the Neolithic. Extensive trade routes existed already in the early Neolithic, as shown especially by the distribution of Dentalium shells, specific types of obsidian, etc. (12). The trade-route propagation that in historical antiquity tended to be along tectonic boundaries, tended to be so in the Neolithic also. For example, most of the obsidian sources are not especially close to tectonic boundaries, but the trade routes that distributed obsidian followed them much more closely (fig. 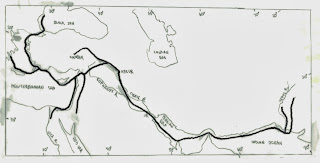 4), extending from Jericho through Damascus into the Taurus and Zagros foothills, and only then into the Mesopotamian plain, thus tracing the boundary between Eurasian and Arabian plates. This carries an implication--that if one were to analyze tectonic relations for each eventual civilization at the stage in which it first acquires extensive trade networks (thus relegating the appearance of bronze, etc. to minor importance), the spatial relation to tectonic boundaries would be quite striking. This suggestion is consistent with observations recorded elsewhere (13). Discussion and questions.—I may have created an impression that trade routes everywhere follow tectonically active boundaries, and that is far from true. Important trade routes extended up the Danube, across Europe to all the Hallstatt sites, to the Orient north of the Himalayas, and to many other tectonically-quiescent destinations. But trade routes between sites that emerged as ancient civilizations tend to follow tectonic boundaries, and apparently played a part in the incremental development of the derivative ones. Even where a plate-boundary route is available between civilizations, it may not always be the most popular route for its entire length. More “fertile crescent” trade followed the Orontes and other routes to the Levantine coast, thence to the Nile delta, than along the Bekaa divide and the Jordan valley to the Red Sea; thus overland traverses across hilly southern Palestine and the Sinai were avoided. So the more-traveled route was on the order of 100 kilometers from a plate boundary when it could have followed the boundary exactly. A similar departure involves the Adriatic in the Geometric era (figs. 1, 2). But for our three separate time periods, emerging trade routes show uncanny resemblances to tectonic boundaries, whether as maritime or overland trade. This is one of our most solid clues to how a relation between tectonic activity and ancient civilizations might work. 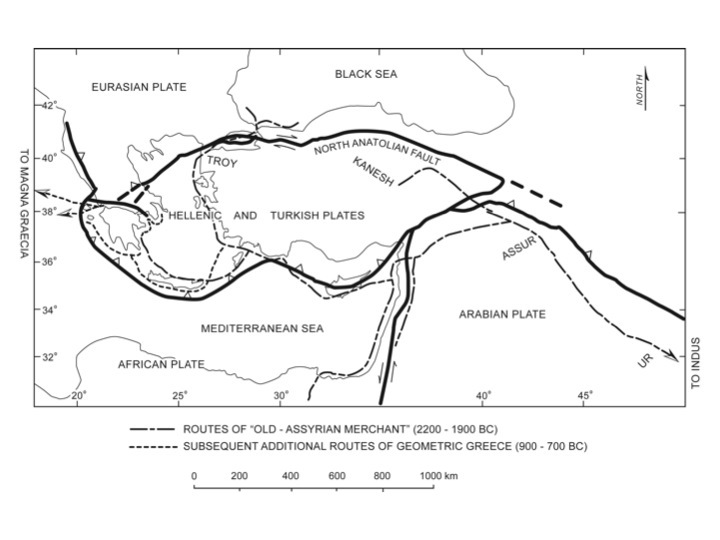 If one measures the length of trade routes propagating toward eventual ancient civilizations as shown in figures 1-3 (14), about 79 percent of this length is within 100 km of an active plate boundary (routes destined for other sites of production or resource exploitation such as Kanesh do not count in this calculation.) A probability analysis is not attempted, as the appropriate structure for it is unclear, but perhaps is unnecessary because its conclusion is intuitively obvious. Trade routes to eventual civilizations tended for some reason to follow tectonic boundaries. What is it about trade routes that first, follow these tectonic boundaries, and second, locate derivative civilizations? Is it that active tectonic zones make the easiest trade routes? Locally this may be so on land—fault zones are easily eroded because of the crushed rock along them, and form strings of valleys and topographic saddles (including strategic mountain passes). Thus fault zones can make convenient routes. But older inactive faults serve this function perfectly well, and inactive faults far outnumber active ones, so the relation to active tectonism is unclear. And of course this logic would seem inapplicable to maritime routes, where the trader must have hopped between plate-boundary islands. There is a possible relation to enhanced water supplies along active faults (15) that could benefit both maritime and overland traders. Perhaps we can best pose our question by thinking like a hypothetical ancient merchant, one who operates an existing trade link. If he were to expand his route, he would look for the next settlement that has wares to trade, is receptive to goods he sells, can supply the needs of his stock or ships, and is on an easy route, preferably one that in turn gives access to points beyond, so that potentially his settlement can become an intermediate stop. What is it about this situation that prompts a decision for a settlement along an active tectonic boundary? Role of other connection types.--Colonization is also a potentially potent propagator of cultural complexity, and ancient Greece and Phoenicia certainly colonized vigorously. Note though that these colonies did not become any of the civilizations treated here, and thus colonization doesn’t directly answer any of our questions. Colonies did influence neighboring cultures that became civilizations; Rome and Etruria, for example, were clearly influenced by Greek colonies in Italy, but were not colonies themselves (16). Colonization, though it could involve force and coercion, existed in large part to facilitate trade with cultures that were less advanced at the time. The vignette below explores an example. We also know that some contact between more-advanced and less advanced cultures was via warfare. Wars have the potential to mix populations and their cultures in new ways, via refugees and prisoners, war brides, new rulers, etc. But the routes taken by invasions show much less relation to tectonics than do trade routes, probably because the goals are different. The Persian invasions of Scythian domains, the Romans into Europe, and Egypt into Nubia involved regional hinterland control. This type of warfare resulted in little propagation of civilization per se and had little association with tectonic activity. Wars did commonly end civilizations, and bring its geography into the orbit of a new culture. But both already existed. Indeed, it seems possible that it is trade, as goods, conveyances and ideas, that both accelerated warfare and propagated cultural complexity, rather than other ways around (17), and the apparent relation of trade routes with tectonism has already been noted. Colonization closely followed the propagation of some trade routes, so that the eventual chain of connections included colonial links. Perhaps the best (and probably the best-described) example is the connection that eventually linked Greeks and Etruscans, with all the cultural baggage that Etruria absorbed. Following the Greek “dark age”, the first links between the two areas were by Euboeans, for whom that age had been merely dusky (18), in some sort of commercial partnership with Phoenicians for whom that age had been even less severe. This combination was apparently ready to go soon after 800 BC, a remarkable fact as trade with the east had only been established in Euboea one generation before the new partnership together vaulted west, with Euboeans providing the actual colonists (maritime colonization can move fast). Some combination of participants already knew the way, as earlier Geometric guest artisans in Italy (and Mycenaean sites and myth) suggest for Euboeans and Sardinian sites for the Phoenicians. But a new motive drove the effort—iron was now a valued commodity but had not been in the previous Bronze Age (when polymetallic mining started in the Colline Metallifere of Tuscany). The site chosen for the first base of operations was ideally suited for tapping a new iron source—deposits of Elba controlled by powerful tribes known to us as the Villanovans, the precursors of the Etruscans. The chosen site, known as Pithekoussai on the precipitous island of Ischia in the Bay of Naples, was not ideal as an agricultural colony (it was later abandoned for one that was). But it was on the southern margin of Villanovan influence and had a good double harbor (everywhere preferred by Phoenicians). Pithekoussai hosted several thousand colonists at any given time from 750 to 700 BC, as shown by the number of graves (19). Most were Euboean but a few were Phoenician. The nature of the settlement was dominated by the needs of trade and iron smelting, and grave goods suggest that most of the women there were tribal and local, even though some were buried with honor as befits wives. Numerous cultural images emerge from Pithekoussai’s graveyard. Nestor’s Cup found there is among the earliest inscriptions in Greek anywhere, about 730 BC. It was made far to the east on the boundary between Greek and Phoenician worlds, brought to Ischia beyond the western fringe of the Greek world, inscribed in a distinctive Euboean alphabet but probably on Ischia, with a sexually suggestive verse reflecting knowledge of Homer, and then used for burial of a child, apparently by someone unaware of how inappropriate the verse was. The juxtaposition of three (or is it four?) totally different worlds typify a frontier situation. The trade in iron from Elba required reaching about 300 km to the north, over territory controlled mostly by Villanovan settlements. It is not clear who did the initial mining—the deposits are shallow and quite near the sea, so Greeks could have been involved. Later the Etruscans did the mining and smelted the ore on the mainland shore near Populonia. But at this earliest period the smelting of ore and some manufacture of iron implements took place at Pithekoussai. The trade itself and the Greek colony it supported energized many Italic settlements, especially coastal ones and estuarine ones that became proto-urban just at this time, both in Etruria and Campania. Latin tribes of this period moved out of the Alban Hills to control coastwise trade at Rome. Thus the Elba-Pithekoussai trade set a pattern for trade and Hellenic influence that is recognizable through Roman times. The propagating trade pattern itself spawned civilizations. What has tectonics to do with this particular progression? That’s not obvious except in the most general of senses. Certainly Pithekoussai was subject to volcanism--Ischia is collection of dormant volcanoes–and to earthquakes—Strabo maintained that eventual abandonment of Pithekoussai was due to earthquakes (and in his description, probably tsunami). Archaeological evidence indeed suggests abandonment of the industrial quarter due to earthquakes (19). Among possible ties to tectonism, three things to watch for are the commodity itself, the character of the site and its inhabitants, and the character of the culture being traded with. The site was an easy one to colonize as local tribes had already come to value Euboean goods, especially ceramics and iron, and relatively militaristic Villanovans were nearby but did not occupy this particular site, which was attractive mostly for its harbor. The site of Pithekoussai is in the midst of dormant volcanoes not only on Ischia but the nearest mainland (Campi di Flegrei with Solfatara, etc. ), and of course Vesuvius itself is in a sense part of this volcanic field, a result of subduction of the African under the Eurasian plate. The proto-Villanovan tribes to the north that controlled the iron ore similarly were receptive to these goods; indeed in these early stages they bought back iron made from their own ores. The culture that we call Villanovan was one that was catalyzed into proto-urbanity by the presence of the coastal trade conducted at first from Pithekoussai (19). But there is no evidence that tectonism per se made any of these tribes preferred trading partners or colony hosts. But let’s look at the iron deposits themselves. Beyond their ease of mining and transport, is their origin and age. They like the Roman volcanic province of the adjacent mainland are very young (20); indeed the ores and their host rocks are in a sense part of that province. The ores formed by the interaction of igneous melts with near-surface rocks to form massive coarse hematite, an easily mined and smelted iron-ore mineral. Both the volcanics and the ores result from melting at depth along the subduction zone extending from the plate boundary that surfaces near the eastern shore of mainland Italy but dips westward under it, such that melting results in igneous activity near and at the earth’s surface above this melting zone in the western part of mainland Italy. Another effect that tectonism had on this situation is more subtle— the Villanovan homeland benefitted from the unusual composition of the young volcanic rocks there (also a result of subduction), which made their soils fertile (21). Thus the linkage we were originally seeking between trade routes (and colonization) and tectonic boundaries turns out to have a clear but complex form. The extension of Hellenic culture into Italy was initially driven by a mineral deposit, one that formed along a plate boundary but at depth, offset from the surface trace of that boundary by the same amount that the eventual Etruscan civilization (and that of Rome) is distant from it. The connection is with the plate boundary at depth, and this third dimension is required to discern it. The cultural response of local Villanovan tribes to the same tectonic stimulus was also remarkable. Their transition into cosmopolitan Etruscans within a few decades of substantial contact indicates great receptivity to new ideas, fueled by sufficient wealth to take advantage of them. Conclusion.—We started this posting with a realization that the close spatial relation of derivative civilizations with tectonic boundaries implied some kind of connection between tectonics and propagation of cultural complexity. Now we have seen that it is trade routes themselves that tend to propagate along tectonic boundaries, and have reason to suspect that this is one of the influences we seek on locations of derivative civilizations. These clues hold some promise for understanding how the spatial relation comes about. Let’s return to our hypothetical merchant considering extending his route. The requisite trade-able goods, demand, logistics, and geography imply resource availability (especially water availability and locally mineral availability as we've seen). But the requisites also imply a receptivity to change in the prospective new trading post. It seems probable that such receptivity would preferentially exist where change is already expected, along active tectonic boundaries. We have seen evidence from many independent viewpoints that cultural character responds to tectonic environments (22). Trade is one of these cultural phenomena, though influenced by geographic and natural-resource factors; trade-route evidence is therefore one of the indications of direct cultural impacts of tectonism, via receptivity to outside influences. 3. These are the trade in pozzolanic cement (made partly from volcanic ash) managed by the Roman empire in the AD era, and the trade in obsidian in the Neolithic of the Near East. Less direct examples involving mineral wealth are discussed in a following section and in July 17, 2013. 4. Coldstream 2003; see also Markoe 2000; McCaslin, 1980; Braudel, 2001, p. 206-228. 5. June 27, 2014 and June 16, 2014). 6. Stone anchor plots from McCaslin 1980, route 2. Some scholars have objected that the distribution of stone anchors does not match the locales of shipwrecks, most of them on the southern coast of Turkey. 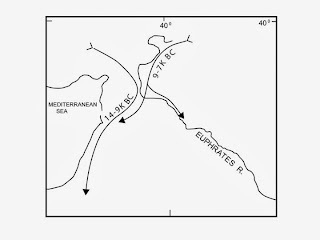 However, there are only three shipwrecks of late Bronze age, Gelidonya, Uluburun, and Iria (Wachsmann 2008), and the locations and cargoes of all are consistent with routes from Cyprus to Rhodes and continuing to the west (or vice versa), given the notorious seasonal winds from the south. Similarly, there are only two of early Archaic age, Kekova Adasi and Kepse Burnu, and their locations and cargoes indicate trade from Cyprus eventually to Corinth. The distribution of shipwrecks—including where they aren’t—suggest ships driven onto Turkish shores on a Levant-Cyprus-Rhodes itinerary (Wachsmann 1998, p. 297). Those shores themselves probably did not make a good trade route; they would be subject to piracy, and rich goods and settlements were elsewhere. The distribution of stone anchors is also useful in another way. They were commonly mounted in front of Bronze-age temples, gates, and other prominent places on land, especially along maritime trade routes. They seem to have some ceremonial or cultic significance in some places (Wachmann 1998, p. 258-293)—not surprising where a population of sailors routinely subjects itself to the dangers of the sea. Indeed we can see equally “cultic” distributions of maritime artifacts and statuary today—including anchors. The distribution of the most cultic stone anchor locales on land is interesting—the Levantine coast from Israel to Syria, Cyprus, and Kommos on the south coast of Crete—all tracing both trade routes and tectonic boundaries. 7. Markoe (2000) notes the scarcity of Phoenician trade and colonization along the north African coast between Egypt and Carthage. 9. Manning and Hulin 2005 suggest that line-of-sight navigation preferentially favored early maritime traffic along the northern shore of the eastern Mediterranean, including a Levant-Cyrus-Rhodes-Crete-Greece route. 11. McCaslin, 1980; Edens, 1992; Wachsmann, 1998; Kenoyer, 1998, 2000; Braudel, 2001. 14. The 79 percent figure was measured from figure 2 in Force and McFadgen 2010, which was in turn derived from figures in previous posts of this weblog. 16. Carthage was a colony, a Phoenician one, but—rightly or wrongly—is not considered to have become a great ancient civilization in it own right. 17. A tentative model of tectonism-trade-warfare relationships---In a culture that begins to trade with a more-advanced one (which tends to occur along tectonic boundaries as we have seen), the vehicles that carry the trade (ships, oxcarts) increase potential mobility, and the trade goods will assuredly include “advanced” weaponry. Now our culture is in a position to besiege its tribal neighbors, which are less mobile and less well-equipped. In a long siege, tectonism heavily penalizes the besieged, as defensive works eventually are damaged (Jericho, Troy). Conquest or hegemony over all the neighboring tribes is established in time, and resulting tribute is a source of the wealth that contributes to the conventional attributes of civilization. To the extent this model is correct, it implies a mechanism for its own end. With the invention of gunpowder, the importance of earthquakes in sieges must have shriveled. 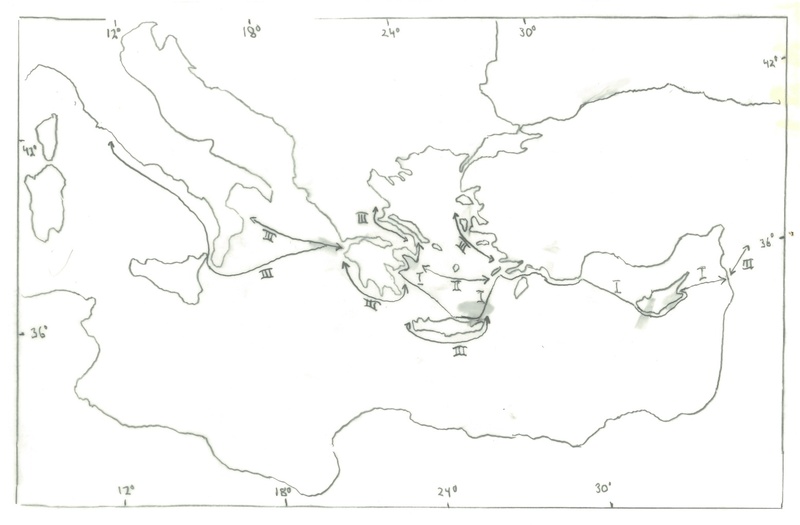 1.—Map of progressive trade-route extension from Phoenicia, then Greece in the Geometric period (900-700 BC), from data in Coldstream (2003), Markoe (2000), and McCaslin (1980). Symbol I refers to trade in Early Geometric I, II to Early Geometric II, and III to Middle Geometric: each shown as additional routes (the preceding ones still active). 2.—Summary map (from Force and McFadgen 2010) relating trade routes of figs. 1 and 3 to tectonic boundaries. 3.—Map of trade routes in Mesopotamia, the Levant, and Anatolia from 2200-1900 BC, mostly from Kuhrt 1998. 4.---Map of obsidian-based trade routes in the early Neolithic, drawn from data in Cauvin 2000 (see also Robb and Farr 2005). The sources of obsidian are generally not quite on plate boundaries (due to subduction geometry), but obsidian trade tends to approach and then follow these boundaries. The sources are in the regions of Catal Huyuk and Lake Van. K is thousands of years. Benvenuti, M., Boni, M., and Meinert, L., 2004, Skarn deposits in southern Tuscany and Elba: International Geological Congress guidebook B18. Coldstream, J. N., 2003, Geometric Greece (2nd ed. ): Routledge, London, 453 p.
Edens, 1992, Dynamics of trade in the ancient Mesopotamian “world system:” American Anthropologist v. 94, p. 118-139. Force, E. R., and McFadgen, B. G., 2010, Tectonic environments of ancient civilizations: opportunities for archaeoseismological and anthropological studies, in M. Sintubin et al., eds., Ancient Earthquakes: Geological Society of America Special Paper 471, p. 21-28. Kuhrt, A., 1998, The Old Assyrian merchants, in Trade, traders, and the ancient city, H. Parkins and C. Smith eds. : Routledge, London, p. 16-30. Manning, S. W., and Hulin, Linda, 2005, Maritime commerce and geographies of mobility in the late bronze age of the eastern Mediterranean: problematizations: in Blake, Emma, and Knapp, A. B., eds., 2005, The archaeology of Mediterranean prehistory: Blackwell Publishing, 333 p., p. 215-251. Markoe, G. E., 2000, Phoenicians: University of California Press, 224 p.
Robb, R. E., and Farr, R. H., 2005, Substances in motion: Neolithic Mediterranean “trade” in Blake, Emma, and Knapp, A. B., eds., 2005, The archaeology of Mediterranean prehistory: Blackwell Publishing, p. 24-45. Eric Force, a USGS geologist for 28 years, is now an adjunct professor at the Univ. Arizona. For the last 15 years, the geology of archaeological sites has been his specialty.